I voted this morning and want to register a complaint about the elimination of the GLBT category. 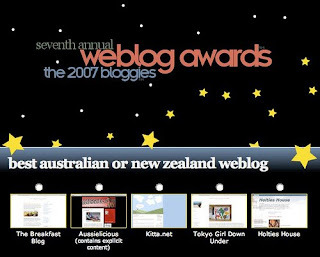 If teens can have a blog award, Australians, Canadians, cooks, et al. why not the vibrant GLBT community? I hope to see this category restored very quickly. Nikolai: Even though I liked having the category (I'm gay myself), I removed it because I decided that having a social group as a category doesn't make sense; you don't write a Web site differently if you're homosexual. 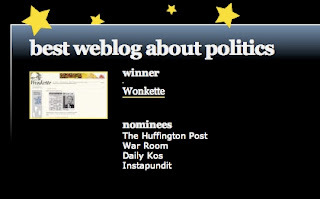 Over the years, people started taking the category to mean gay-themed weblogs, which could be a proper topical category, but not enough are nominated in comparison to other topical categories. After PerezHilton.com won last year, it seemed that the category had completely lost focus, since he neither writes about himself nor gay topics. GaY: I think a better solution might have been changing it to, "best weblog about LGBT matters" or something like that. The variable isn't the sexuality of the writer, but rather the important content. It's just SUCH a thriving community (we just had a major event in DC; many of our personalities book mainstream gigs; etc), and one that really doesn't stand a fighting chance in some of the other categories. I hate to see the LGBT crew lose any of the attention that we have to fight so hard to build. Nikolai: I was considering it, but looking over the nominations, there really aren't a whole lot in comparison to most of the other topical categories. But maybe if Travel fails to gain nominations, a gay topical category could be a candidate for next year. Thanks for the link to your conversation on the matter. I think there are PLENTY of blogs that are gay themed or that focus on the author's gay orientation. My own is subtitled "A blog for the Arts and Gay Issues" and since the arts are so heavily gay anyway . . .
A great many gay blog authors write about non-gay issues and topics with a gay sensibility which illuminates them from a valuable alternative angle. Others simply write about their lives, including their sexual encounters, which is about as gay as it gets. And there is a significant subculture among gay blogs about the challenges, traumas and rewards of coming out. I don't think we're so difficult to see on the web, or that we're so few in number, and I wonder that "social group" is an apt description. There's far too much diversity within Gay America to refer to it as a social group, as if we all share the same mores, values and politics. I don't wish that Travel or any other category get kicked out of the lineup--but I certainly don't think Best GLBT blog deserved to be dropped, either. Thank you very much for being in touch and giving me an opportunity to expand my comments further. I must have found the link to this personality analysis from some other blog but regret I cannot remember which. The results are pretty cool--I just hope some of them are true about me! Go to http://www.personaldna.com to find out about your personal DNA. that sounds like you, alright. I too smell a humbug about the LGBT issue. I took the personal DNA test and it was cool. There were some stuff that was quite a spot on regarding myself. I'm with you on the GLBT blog issue. Try to embrace the imaginative, creative part of your personality more often. Try moving beyond the things that you find comfortable—open yourself up to a broader range of experiences.